The last couple of weeks has seen some highly anticipated comebacks…Astro, Huta’s (BtoB) solo album, ATEEZ, Roh Taehyung’s (HOTSHOT) solo, Bang’s solo, and Seventeen among them. And let me tell you, I’ve been happy with all of it. I mean, not every single song on all of the releases has floated my boat, but the average number of awesome to eh has been pretty above par. That’s amazing. That’s not common. I don’t know if my tastes have changed so significantly that even the chaff sounds good or if everyone has just upped their game to the point where I’m constantly pleased if not blown away. As folks reading a Korean entertainment blog, I am willing to bet that you were just as excited for some of these groups as I was. I mean, there is very little chance that you haven’t seen the Home MV yet or that you weren’t fawning over ATEEZ’s bandit outfits. That group is seriously the next big thing. I give you my word. I have been obsessed with them for a long time and fully invested since before debut. I think they’ve got something special and the Kpop world is taking notice. But these weren’t the releases that made that hollow space in my chest ache in anticipation. You might remember last year when I very clearly declared that I want to be IMFACT’s song NANANA when I grow up. I completely understand that the likelihood of my actually growing up is pretty slim and the chances of maturing into that song are even smaller, but a person can dream. We are always telling girls that they can be whatever they want…that should hold true for me too. And I want to be that song. 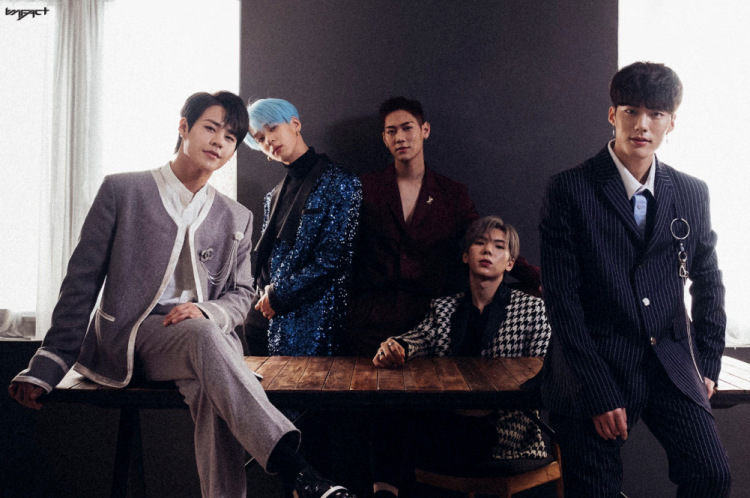 After releasing six million covers and impossible to buy solos over the course of the last few months, IMFACT came back last week with a single to celebrate their third anniversary and it’s a peach. The single has two older songs The Light (I love that song) and NANANA alongside two new little diddies. The title track is Only U, an EDM number working hard to replace its predecessor in my heart (it won’t, but it’s trying). The tune does a good job of highlighting the vocal line as well as the rappers and their unique voices and styles. I mean, Ungjae and Jian are about as different as two idol rappers can be and yet, the combination of their styles in this song and in this group, in general, has always been a delight. The MV is gorgeous. In the words of KpopontheDL, ‘I want to be haunted.’ The group members are ghosts? memories? All taking care of a lonely young woman clearly just putting in all of her effort to get through the day. Well, that and make pasta from scratch…that’s just ambitious. They delight in making sure things work out for her. I could use those ghosts in my day-to-day. The other thing that makes me smile to no end is that at the end SHE CAN SEE THEM or she remembers a time when they were really there. I’m not entirely sure. But they are together and they are feasting and laughing and loving. And I want to be there. I want to be their U. Well, I want to be one of the U’s. I mean, if I were the only U, the group couldn’t survive. They need lots of U’s to buy their stuff so they can stay together and thrive. But not too many U’s. I don’t want to share with EVERYONE. And by U, I obviously mean IF. IF’s are their fandom and I am a dedicated IF. Plus, Ungjae has a nose ring and Sang has an eyebrow ring now and my whole body vibrates with how perfect that is. Bonus dance practice video because it’s the only way I’ll be able to stop myself from also posting ALL OF THE STAGES. I’ll save those for Friday nights with the Colorado NerdHerders. They’ll love it. Because I’ll make popcorn after.